Marc Jacobs Lola 1.2ml perfume sample, Free added extra. Total value of box = £106.99. Ok so the standout product in this box is obviously the Chanel Illusion D’Ombre Eyeshadow. As far as I’m aware this is the first time Cohorted have included a Chanel product, and I think it will be very well received. This eyeshadow has a cream to powder formula – so it applies like a cream but feels like a powder on the skin, which I love. And as expected with Chanel, the formula is of superior quality. Shade 91 is actually rather lovely – I say actually because it’s a blue, and blue eyeshadow is definitely not everyone’s cup of tea. This is a deep midnight metallic blue though, perfect for a smoky eye. The Bare Minerals Pure Transformation Night Treatment sounded familiar to me, and then I remembered this was included in Cohorted’s second ever beauty box, nearly a year ago in March 2015. This is a bit of a funny product, and by funny I mean it’s a powder that you apply to your face before going to bed! It’s supposed to reduce the appearance of pores, increase luminosity and even out skin tone, and I must admit I never got round to trying it out. This is definitely on my ‘to-try’ list now so I’ll let you all know how I get on! The third product on the list is a Dove True Tone Underarm Dark Mark Eraser – now this product isn’t mentioned in the included information booklet, but the Pixi pencil which is mentioned is missing – so I’m guessing Cohorted ran out of Pixi and included this product instead. I must admit I’m a bit disappointed because I love Pixi products, and then pencil in the booklet does look rather lovely. Anyway, this ‘Dark Mark Eraser’ definitely sounds interesting. It’s actually a night cream, that you apply to clean armpits at bedtime, with the aim of brightening your skin. I think this is going to be a bit hit and miss – some people will thick it’s a great idea, and I think others won’t be so keen. Next is the Cargo Cosmetics Long Wear Lip Gloss in Madrid. This is a sheer mauve shade packed with silver glitter. It’s a nice little gloss that’s non sticky and long lasting. 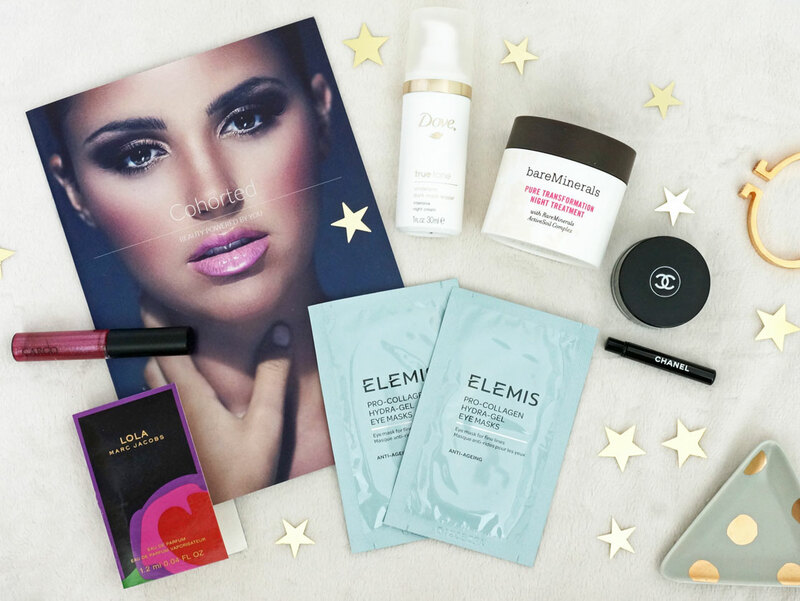 The Elemis Pro Collagen Hydra-Gel Eye Masks are a welcome addition to this month’s box too. This is a first show from Elemis, which is one of my favourite skincare brands. These masks aim to instantly reduce the appearance of fine lines and wrinkles, leaving the eye area looking smoother and feeling moisturised – they sound right up my street. And lastly the Marc Jacobs Lola 1.2ml mini sample. I’m a bit of a perfume fanatic so fragrance samples are always appreciated here! Overall this is a great little box, and though I think I’ve had enough of seeing Cargo products for now, it’s great to see Cohorted have included Chanel and Elemis this month. I’d love to see more of these brands in the future! On that note, I’d love to hear which brands or particular products you’re not so keen on in beauty boxes? And if there are any you’d really love to see?